One thing that Oliver + S patterns do really well is teach new skills as you sew them. I’ve heard many people describe them as a “sewing class in an envelope,” and I know I’ve said it myself! The more Oliver + S patterns you sew, the more skills you pick up. If I want to learn a particular new technique (welt pocket, invisible zipper, lining, setting in a sleeve), I can rely on Liesl’s clear and concise instructions to get me there. I can then apply the skills I learn to other things I sew. Once the technique is clear in my head, it becomes second nature to me. There are a lot of sewing resolutions floating around this month, it being the new year and all. Some people have vowed to finally tackle buttonholes, zippers, plackets, knits, etc.–that pesky skill they want to learn but have been avoiding for too long. Well, I’m here to help with that! As my new year’s gift to you, I’ve compiled an index of sewing skills and the Oliver + S pattern that teaches that particular skill. With this list, you can find the skill you’re looking to master, select a pattern that will teach you that skill, and then get to work on a project. 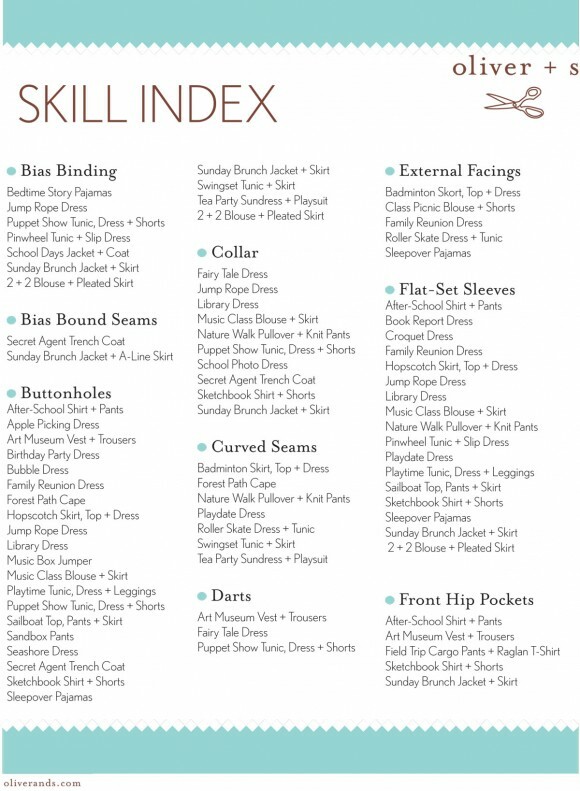 To give you inspiration to stretch yourself and increase your skills this year, we’ve made the complete skills index into a PDF that you can download, print out, and keep in your sewing space. Are there any skills you’d love to learn that you don’t see listed in the index? Please share! Flat fell seams? Are there any? … and hey, shouldn’t there be a ‘Zipper’ category up there?? I LOVE, LOVE, LOVE having this list. Thank you!! I’m interested in learning how to make my own piping, both flat and corded, and how to apply it–Liesl’s way, of course. Do any of the patterns teach piping?